Electricity is made up of two opposite kinds of charges (officially called positive and negative). It doesnt matter what you call them, the important part is that they are opposite. We'll can call them Red and Blue since we have hats of these colors. Like charges repel. Opposite charges attract. Older audiences already know about charges. You may want to eliminate this demo for audiences that don't have kids younger than 5th grade or so. Make sure the "charges" agree on what they're going to do when they meet, so they don't collide or get confused and look dumb. This is the first electricity demo. Tell the audience were switching gears and were going to talk about how electricity works. Ask them for examples of things that use electricity. Ask if anyone knows what electricity is made of. Electricity is made up of tiny little things that we call charges. There are two different kinds of charges. Most scientists call them Positive and Negative, but the names don't really matter. We can call them Red and Blue. The most important thing to remember about charges is that charges that are the same want to get as far away from each other as they can; and charges that are different want to get as close together as they can. Get two Van volunteers and tell the kids that you're going to make them both "Red" charges by putting the red hats on them. Once the charges are activated, they should proceed to run in opposite directions and hide from each other. As you walk over to one charge, tell the audience that youre going to switch one of the Red charges so theyre a Blue charge, and see what happens. 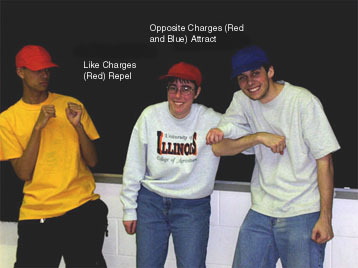 Change the red hat for blue, and as the charges run together, restate that opposite charges want to be close together, and like charges try to be far apart. Break up the charges dancing around before it makes everyone sick.